Beginning September 18, 2018. Click to view schedule. Young Adult Ministry, 1st Thursdays at 7:00 p.m. Click to learn more! Wherever you are in life, we invite you to come and discover the community of faith at Weaverland. As a faith community, we attempt to live into our mission and core values in everything we do. We welcome you…come and join us! New Here? Whether you’re just visiting or looking for an inspirational worship experience, Weaverland offers an environment in which you can come as you are. 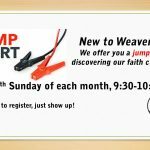 Jump Start — New to Weaverland? We offer you a “jump start” into discovering our faith community. Learn more here. Watch our service live on Sundays 8am & 10:30am on Livestream.